The thing about history and the past is that we get so caught up in events and generalizations that we forget that people, just like us, lived their own individual lives. My Uncle Phil died on September 11, 2001. He is a hero, for sure, but he was also an incredible human being who was a father, son, brother, uncle, nephew, firefighter, and friend. It’s important to remember the ultimate sacrifice he made for others with his life, but it’s even more important for me to remember the life he led with a full heart. My mom’s side of the family is very close. While my immediate family moved a few times, everyone else remained in New York and we made time to see them fairly often. I am so grateful for that. A lot of the time we stayed with my grandparents when we would visit. That’s where I have some of my favorite memories with my Uncle Phil. He would come over in the morning and bring us authentic New York bagels (delicious!) and we’d all hang out at breakfast. One of the things I loved most about my Uncle Phil is that he would listen to me as if I was an adult. I would talk to him about school, the different activities I was participating in, and what I was up to in general. I was 11 years old when he died. But I still have the memories of him and what he brought to our family. Uncle Phil had a really distinct throaty laugh, a huge winning smile, and was the bearer of big hugs. When I was probably about 5 years old I visited Uncle Phil at the firehouse. We got to hop into the firetruck, color and learn about fire safety, and eat with some of the firefighters. 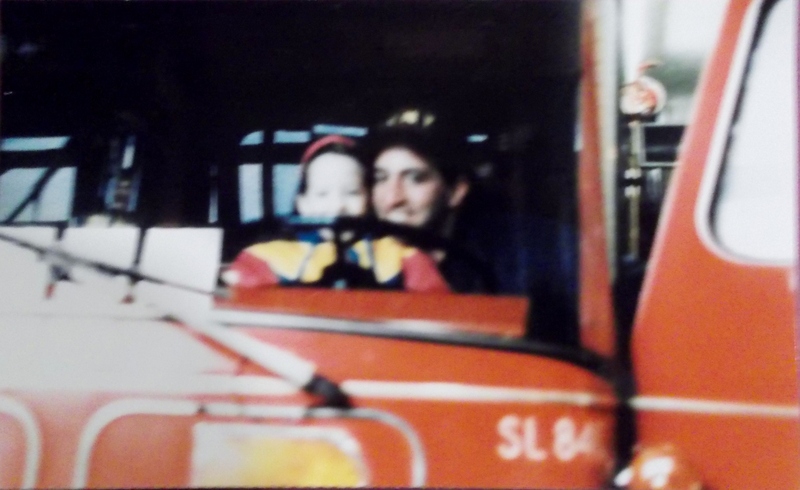 Uncle Phil and I in firetruck!! It was the first time I ever had a New York eggcream. Now, whenever I have that I think of him. My uncle also taught me how to play soccer. I loved playing, running around, and having fun with him and my cousins (his kids). The weekend after September 11th I played a game and scored my first and only hat trick (3 goals). Ever since, whenever I stepped out on the field I would think of him. Uncle Phil really valued hard work. He was proud of his kids for trying their best in school and elsewhere, and this pride trickled down to his nieces and nephews as well. 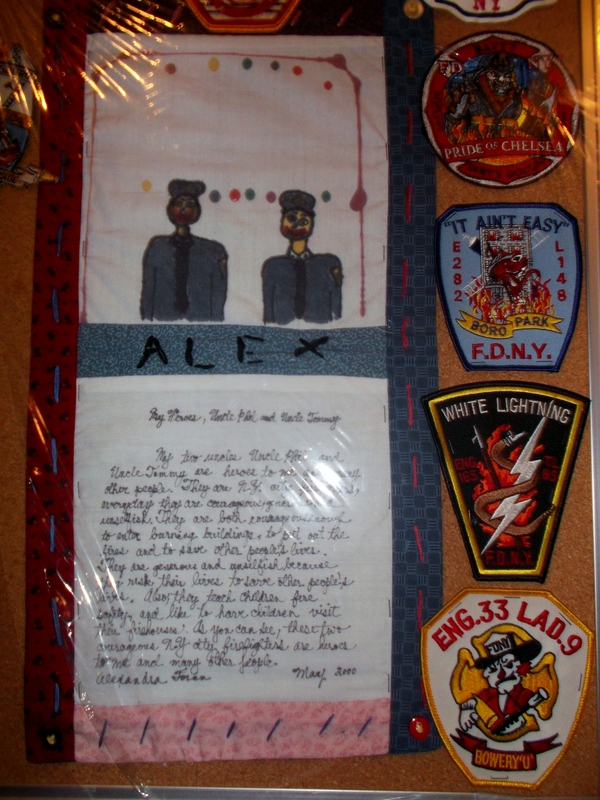 He studied and worked hard to become a Lieutenant and was studying even harder to try to become a Captain in the FDNY. Despite having a tough work schedule, he still made sure he had time for the most important thing: FAMILY. He lived life to the fullest. My uncle was a loving and compassionate person who enjoyed being with his family and friends, participating and watching sports, and generally having a good time (truly, the finer things in life). When I was in fourth grade we had to write about a person or people in our lives who we thought were our heroes and draw a picture of them. I chose my Uncle Phil and my Uncle Tommy, who were both NYC firefighters (and brothers). Little did I know that a little over a year later Uncle Phil would perish on September 11, 2001. I was able to give copies of the piece to both of my uncles. Unfortunately, someone had drawn something on my artwork so my uncles ended up looking like a bizarre version of Bert and Ernie! My Uncle Phil inspired me to be the best person I could be. If you took the time to read this post, I hope you take a little more time to remember all those who died on September 11, 2001 and remember that they too had lives before their tragic deaths. Last week my wife and I were at the World Trade Center Memorial. We did not know anyone who’s name was inscribed, but I took a picture of inscription of Philip Scott Petti probably because of the flower placed there. At the time, I said to myself that I would try to find out something about this NY firefighter and your website has allow me to accomplish that goal. Thank you so much for developing it. The great crowds at the memorial is a testimonial to all of the first responders and ordinary citizens who died there. While your loss was personal, all Americans lost too and this memorial is a wonderful was to honor and remember their unselfish sacrifice. Thank you so much for posting on my blog. I’m happy you shared your story with me. I found out when I recently visited the WTC Memorial that the 9/11 museum is going to place a white rose at the memorial for every person’s birthday. The day you visited was my uncle’s birthday! Thank you again for seeking out more information about my uncle and for taking time to pay your respects to all those lost on September 11, 2001 with your wife. You are right, it’s important to remember our history and I am pleased that there is finally a proper memorial to honor and celebrate the lives of all those who perished that dreadful day. I was recently in New York with my sister to visit a friend in Manhattan. On Sept 16, 2014 went to see the World Trade Center Memorial. At the site I took a picture of some of the firefighter’s name inscribed beside Ladder 13 and your uncle’s name was one of the ones listed. On this CanadianThanksgiving weekend I found myself thinking about 9/11. I scrolled through the pictures on my iphone and for whatever reason started to do some searches on the internet. I felt compelled to learn something more about the lives of the NYC Firefighter heroes. So here I am on your blog reading about your favourite uncle Lieutenant Philip Scott Petti. Thank you for sharing. It felt good to pay respects at the memorial site but your blog has made it much more personal and as a result more profound. I am deeply sorry for your loss. I’m so glad you found this post and shared your sentiments here. Thank you for wishing to learn more and for going to the site itself, I know how trying and hard it can be to be at the WTC site but I feel it is so important we remember all those who perished on September 11th. Thank you for paying your respects here, I so appreciate it. The loss of my uncle was so traumatic and yet an amazing amount of love and support came to me and my family from so many wonderful and caring people. It’s amazing how much we are capable of especially in the midst of tragedy. Thank you for sharing your story and more importantly your Uncle Phil with so many people who didn’t know him personally. I met your Uncle Tom at the 2002 Winter Olympics in Salt Lake City. He was part of the opening ceremonies and I was working for NBC. He shared stories of his brother, your Uncle to us and even gave us a FDNY hat and shirt. 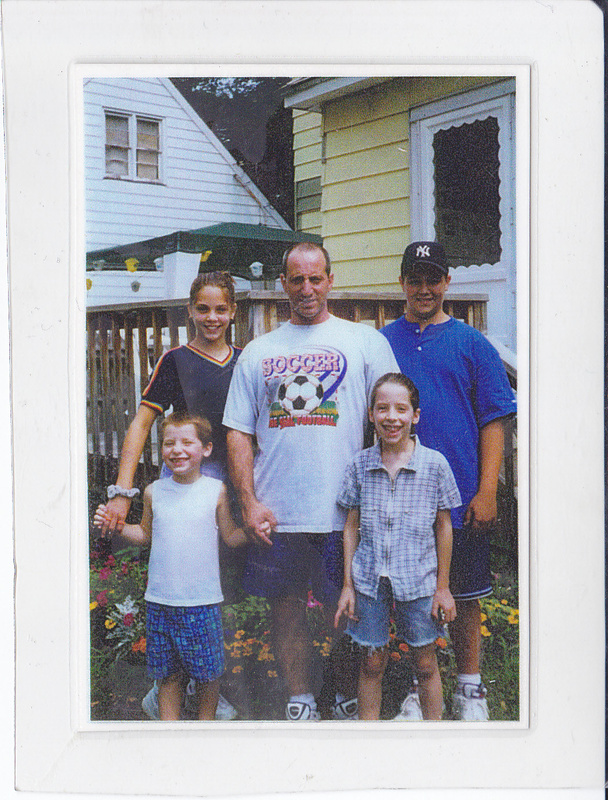 Ever since then I have thought of your family and your Uncle on this day and everytime I’ve visited New York. Each time I go to the WTC Memorial I stop and say a little prayer at your Uncle’s name. He is remembered by so many people and for each of us he has impacted our lives and made it better. He still lives within each of us. I can’t understand the depth of your personal loss but I hope knowing that other people think of you, your family and your Uncle it somehow can lessen the heartache.